Photo: Mirsad Tokaca, head of the Sarajevo-based Research and Documentation Center, showing a DVD that contains the results of the research on human losses during the Bosnian war during a presentation in Sarajevo, Thursday, June 21, 2007. Contrary to the widely used rough figure of 200,000, the team documented over 97,000 deaths caused by military activity during the 1992-95 Bosnian war. This is so far the most detailed scientific research regarding this issue and has been evaluated by foreign experts for several months. 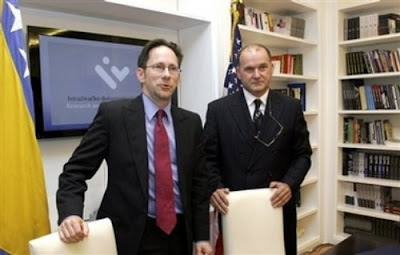 Photo: During his visit to Bosnia and Herzegovina, United States Ambassador-at-Large for War Crimes Issues Clint Williamson, left,and Mirsad Tokaca, President of RDC , visits the Library of the Research and Documentation Center in Sarajevo,on Thursday, June 14, 2007. Ambassador Williamson said in Sarajevo that the prosecution of war crimes suspects from the former Yugoslavia remains one of the priorities of the US administration. A three-year investigation by the Sarajevo-based non-governmental Research and Documentation Center revealed that the figure of dead was 97,000 - said Mirsad Tokaca, head of the research project - the only scientific research conducted into the issue so far. The figure could rise by a maximum of another 10,000 due to ongoing research, he added. Tokaca said the group began their research in 2004 in an effort to prevent death toll numbers from being used for political purposes. The research was concluded in June 2006, but it took several months for an international team of experts to evaluate the data. The Bosnian Book of the Dead was finally released in Sarajevo today by the Research and Documentation Centre (RDC) after almost four years of work. According to the group's research 97,207 people were killed during the Bosnian war. Of those, about 60 percent were soldiers and 40 percent civilians. Some 65 percent of those killed were Bosniaks, followed by 25 percent Serbs and more than 8 percent Croats. Of the civilians, 83 percent were Bosniaks, 10 percent were Serbs and more than 5 percent were Croats, followed by a small number of others such as Jews or Roma. Almost half of the victims died in the first months of the war, when Serb forces helped by the Yugoslav army gained control of two-thirds of Bosnia by expelling and killing many in their notorious “ethnic cleansing” campaign. The total number also includes names of 3,372 children who died during the war. According to this data, 89 per cent of victims were men and ten per cent were women. "To avoid manipulation with numbers not based on facts, which then appear as an additional element for incitement [of hate] ..., we launched this project to establish the truth," said Tokaca. Casualty figures from other conflicts in the region, especially during World War II, were often manipulated by Serbian politicians, and statistics and death tolls were used to justify attacks against other ethnic or religious groups, which culminated in horrendous genocide in Srebrenica of at least 8,000 Bosniaks. On the other note - during the war, local authorities in Sarajevo publicly mentioned, on several occasions, that about 200,000 people had been killed. Up to now, this estimate is the one mentioned most frequently by the domestic and international public, although it has been denied by various parties on several occasions. However, it is not the only estimate we have. Thus, estimations varied from 25,000 to 250,000. According to Tokaca, this "playing with numbers" was the main reason why the RDC decided to collect details and names of victims. Tokaca's team worked for three years with thousands of sources, collecting 21 different facts about each victim, including names, nationality, time and place of birth and death, circumstances of death and other data. In any case, a brisk discussion is expected in Bosnia in Herzegovina about the possible ways of using the data for the determination of truth and for reconciliation. Mirsad Tokaca, RDC president, has said that the aim of the project was to identify each single victim and prevent any type of manipulation of numbers, which he considers has been the case for years. "This is not a story about numbers, but about citizens who died during the past period," Tokaca told Justice Report. In other words and with respect to Srebrenica genocide; a POW, a surrendered soldier without a weapon would all be listed as 'soldiers' on the RDC list; even though they were clearly non-combatants at the time of the deaths. When registering such cases, RDC was governed by the official data that was available. The evaluation indicates that such practices lead to over-reporting of soldiers and under-reporting of civilians. "It is important to emphasise that 'status in war' does not provide correct insights in relation to victims of combat versus non-combat situations, neither does it inform about legitimate victims of violations of the International Humanitarian Law, IHL," the evaluators say. "Status in war is a simple measure of whether or not a person was a member of a military/police formation at the time of death, or generally was a defender, or a civilian. As such it offers a good basis for a further more specific investigation into this issue. We therefore advise that this part be improved," it is said. Three international experts - Patrick Ball, Ewa Tabeau and Philip Verwimp - all with rich experience in similar projects, have reviewed the database and have assessed it favourably. "This database represents an extraordinary achievement of all those who were involved in its preparation," the experts have said, adding that some improvements are still possible. The trio considers that the data collected by RDC gives a "good overview of war happenings related to victims and the way the individuals died". Verwimp, a researcher in the field of political economy in developing and post-war countries, human rights and genocide, warns that the RDC database does not mean that work on determining the number of war victims in BiH is over. "Many consider the number of 96,895 as the overall total of victims of the 1992-1995 war in Bosnia, which is not correct. For several reasons, this number should be seen as an approximation of a minimum and not as a complete total," he told Justice Report. Tabeau believes that the information from the database can be an efficient tool for fighting myths about the war. "These results might be an extremely efficient tool in fighting myths, but only if there is a will in the society to deal with the past in terms of facts, not myths," said Tabeau, who worked as a project manager in the demographic unit of the Hague tribunal's prosecution office. In this role, she studied the demographic consequences of conflicts in the former Yugoslavia, with a main focus on the number of victims during the wars in this region. However, even though more than 90,000 names have been included in the database, the RDC does not consider that its work on the project has been concluded. "The database remains open and whoever contacts us and offers new data we are willing to consider it and add new names," said the IDC's Tokaca. Patrick Ball, a member of the evaluation team who took part in the work of nine truth commission across the world, said Tokaca's database "is better than any I worked with so far. The project continues but I do not expect his number to rise for more than 10,000 cases." The figures include both the missing and those who died due to military activities or torture. The project does not include people who died during the war in accidents, through reckless handling of weapons, due to starvation or lack of medication. "What comes to mind are 12 babies that died in Banja Luka because the hospital had no oxygen or six civilians in Gorazde who died because an airdropped American humanitarian aid package fell right on them," Tokaca said. "Such cases were not counted as they are regarded indirect deaths." The organisation also plans a breakdown of the total into those who died from the “indirect” effects of the war, like the lack of medical treatment or conflict-related accidents. Tokaca's team of 20 people conducted thousands of interviews, visited 303 graveyards and went through records of all three armed forces involved in the war as well as other sources. "This study was done to change the perception of the past and to allow us to overcome the hot heads and switch to calm dialogue," Tokaca said. The project, called "The Bosnian Book of Dead," was funded primarily by the Norwegian government. "Truth and knowledge are crucial prerequisites for reconciliation," said Norwegian Ambassador to Bosnia, Jan Braathu. "The long-term consequences of not facing the past on a basis of established truth are alarming." Ewa Tabeau, head of the Demographic Unit research team of the U.N. war crimes tribunal in The Hague, said the project's figures were the minimum number of war deaths. Although not complete, "it is the largest existing database on Bosnian war victims," she said. Other funders were the Swedish Helsinki Committee, the U.S. government, the U.S. Institute of Peace, the Dutch government, the United Nations Development Program and the non-governmental Heinrich Boell Foundation, the group said. Similar databases exist in several post-war countries. In 1999, research was undertaken to determine the exact number of victims in Rwanda, Kibuye province, and the project was called Victims of Genocide in Kibuye. Similar efforts have been undertaken in Northern Ireland in 2000, in South Africa within a Report of the Truth and Reconciliation Commission, in El Salvador in 1997 and in Guatemala by the Commission for Historical Clarification in 1998. Justice Report has found out that similar databases might soon be available in Serbia, Croatia and Kosovo, where work is already being done along the same lines as those applied in BiH. It is significant that local authorities have not done much to help the research, although they did not try to prevent it. Instead, the Book of the Dead has been compiled with support from foreign governments, mainly those in Norway and Switzerland. The research itself started in 2004. More than 240,000 pieces of data have been collected, processed, checked and compared in order to get the final number of more than 96,000 of names of victims, belonging to all nationalities. "We are not publishing the number but rather the names of BiH citizens who died in the period from 1991 to 1995. Our intention is to stop talking about numbers and start talking about people," Tokaca has said and added that the RDC, while researching the population loss, registered all BiH citizens who were killed or disappeared due to direct military actions or were murdered in detention centres. "This group comprises of soldiers and civilians. What is important to us is that the total number has its structure, a range of details and explanations. For almost every case, we explained the time and geographic dimension of death, distance from place of residence to place of death, formation in which soldiers were," the president of IDC Sarajevo explains. The research was done in several ways. Most pieces of information were collected through direct contact with witnesses, families of victims, through newspaper articles, various registers and also by visiting of cemeteries. Tokaca says that his researchers have visited more than 400 cemeteries in order to collect names of victims. It is interesting that the database also contains 512 names of BiH citizens who died in Slovenia and Croatia during 1991. Tokaca says that most of them were members of the Yugoslav People's Army. In addition, the names of 16 persons - who were wounded during the war and died in 1996 from their wounds - have also been registered. "According to available data, the highest number of victims - more than 30 per cent of the total number (28,666) - died in Podrinje, and the second highest number (14,656) perished in Sarajevo," Tokaca explained. In addition to the names of victims, many other indicators about the war in BiH can be derived from the database. It is therefore obvious that most civilian victims - 45,110 - died in the period May to August 1992. 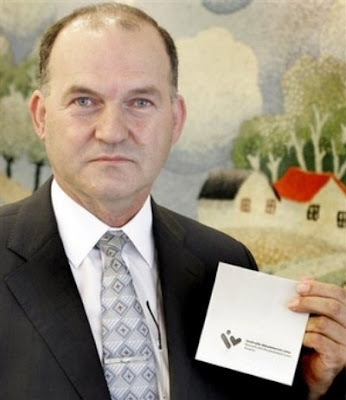 "Srebrenica was just a finishing act," says the president of the RDC. In any case, the evaluation has come to an important conclusion - that the research has been done with no ethnic partiality. Probably the biggest problem in the database is how to define the status of victims. For IDC researchers, the only possible way was to rely on existing official registers, mostly military. According to available data, 40 per cent of war victims in BiH were civilians and 60 per cent were soldiers or members of police forces. Tokaca explains that he is aware of this shortfall. However, he says that the existing registers are unreliable. For many, the true value of this database is that all who want to can search for the names of family members and friends who were lost in the war. This way, they can find the date and place of death, and the circumstances in which the person died. Experts consider that the database can be a valuable source of information for people who study the war in BiH, but it can also be used as a relevant source in court processes, both before domestic and international courts. However, Tabeau notes that it cannot be used at every stage of the legal process. "The Bosnian Book of the Dead can be used at certain stages of investigations. It is premature to speak of many other purposes of the database, such as using it for purposes of evidence where detailed information records about victims and perpetrators are required, and without supporting it with additional sources of data," Tabeau told Justice Report. She thinks that the database is important for fighting myths and demystification of various wrong statements about the war. "The education of the entire society regarding the past is improved," she said. "One more advantage is that young researchers can learn from this project and apply this knowledge in the future." Bosnia-Herzegovina's pre-war population of 4.4 million was 43 percent Bosniak, 31 percent Bosnian Serb and 17 percent Bosnian Croat, according to a 1991 census.